Understanding the laws of supply and demand are central to understanding how the capitalist economy operates. Since we rely on market forces instead of government forces to distribute goods and services there must be some method for determining who gets the products that are produced. This is where supply and demand come in. By themselves the laws of supply and demand give us basic information, but when combined together the are the key to distribution in the market economy... price. Demand is comprised of three things. It is not enough to merely want or desire an item. One must show the ability to pay and then the willingness to pay. If all three conditions are not me then the demand is not real. This, by the way, is the purpose of advertising. While many may want a product it is quite another to be willing to pay. Advertising attempts to move a consumer from mere want to action. These day even condition two may not stand in the way of a consumer. With the advent of credit cards we are able to purchase products without the current ability to pay. Many stores and car dealers even offer on the spot credit though the interest rate may be quite high. What factors alter your desire, willingness and ability to pay for products? Some factors include consumer income, consumer tastes the prices of related products like substitutes for that product of items that may complement that product. Marginal utility - extra satisfaction a consumer gets by purchasing one more unit of a product. Diminishing Marginal Utility: The more units one buys the less eager one is to buy more. Think of diminishing marginal utility this way. It is a hot summer day and your sweating bullets. You come across a lemonade stand and gulp down a glass. It tasted great so you want another. This second glass is marginal utility. But now you reach for a third glass. Suddenly your stomach is bloated and your feeling sick. 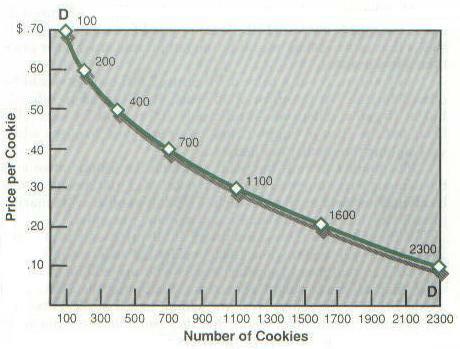 That's diminishing marginal utility! Changes in demand - change in the demand for a product that occurs when price drops. Changes in the Quantity Demanded - change in the amount of a product demanded regardless of price. The difference is subtle but important. If the demand of ice cream goes up in the summer it is because consumers demand has truly increased, clearly it is hot. In the case the business can most likely raise prices without suffering a drop in sales. This is a change in quantity demanded. If sales of ice cream were to increase in January as a result of a price cut, however, the information we would be receiving is that the demand was artificially manipulated. It really tells us that actual demand is low and that extra efforts had to be made to increase sales. This is change in demand. When there is a change in amount purchased (tied to demand) due to lower prices and surplus spending money it is called the income effect. Income effect basically happens when salaries are on the rise. Another economic phenomenon tied to demand is Substitution Effect. This states that as prices drop consumers will buy more than usual at the expense of a different product. Take a sale at the mall for example. If jeans are on sale for a great price consumers will by extra jeans even if they had previously planned to buy something else. This is that great deal you just cannot pass up. What would the opportunity cost be? That item you passed up and substituted for. quantity demanded in inversely proportional to price. Simply put, the higher the price, the lower the demand and the lower the price, the higher the demand. Quantity supplied is directly proportional to price. Clearly the law of supply is the opposite of the law of demand. Don't these both make sense to you? Consumers want to pay as little as they can. They will buy more as the price drops. Sellers, on the other hand, want to be able to charge as much as they can. They will be willing to make more and sell more as the price goes up. This way they can maximize profits. Now that we have covered both demand and supply we have to combine both together. The place where what sellers are willing to sell for and buyers are willing to buy for is called market or equilibrium price. This is the price the product will sell for. Price is negotiation between the buyers and the sellers. To figure out price one has to law the supply and demand next top each other. When we then plot and draw both curves together we are able to see the market price of the product. 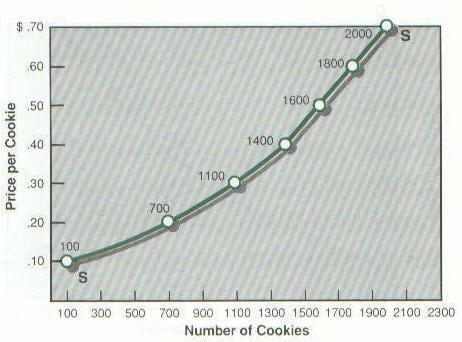 The market price for cookies in this graph is 30 cents. 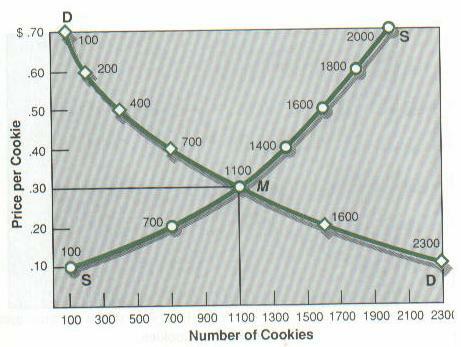 The quantity sold and bought is 1100 cookies. Prices are key ingredients in our economy because they make things happen. If buyers want to own some items badly enough, they will pay more for them. When sellers want to sell some items badly enough, they will lower their prices. Prices play such an important role in economic life that the United States is often described as a price-directed market economy. Let us see why. 1. Act as Signals to Buyers and Sellers. One of the things that prices do is carry information to buyers and sellers. When prices are low enough, they send a "buy" signal to buyers (consumers), who can now afford the things they want. When prices are high enough, they send a "sell" signal to sellers (retailers), who can now earn a profit at the new price. 2. Encourage Efficient Production. Prices encourage business people to produce their goods at the lowest possible cost. The less it costs to produce an item, the more likely it is that its producers will earn a profit. Firms that are efficient will produce more goods with fewer raw materials than firms that are inefficient. Producers strive for efficiency as a way of increasing their profits. While these efforts are in the best interests of the sellers, all of us may benefit because we are provided with the things we want at lower costs. 3. Determine Who Will Receive the Things Produced. Finally, prices help to determine who will receive the economy's output of goods and services. The price that a worker receives for doing a job is called a wage. The amount of this wage determines how much the worker has to spend. What the worker can buy with those wages will depend, in turn, upon the prices of the goods and services the worker would like to own.